The energetic emperor Justinian I ruled Byzantium from 527 to 565. His great ambition was to unite the Roman Empire. He succeeded at great military and financial cost. Justinian gained further fame with beautiful buildings such as the Hagia Sophia. His acclaimed Codex Justinianus was a milestone in the history of law. In Justinian, the players secretly influence the emperor's counselors, so that the counselors will serve the player's cause when Justinian makes important decisions. Three times during the game an important decision is made, and is usually accompanied by a dramatic shift in power. It is hard to predict when the emperor will ask advice, and which matter will take precedence. Even worse: one of the four issues is never brought forward, increasing uncertainty for all. 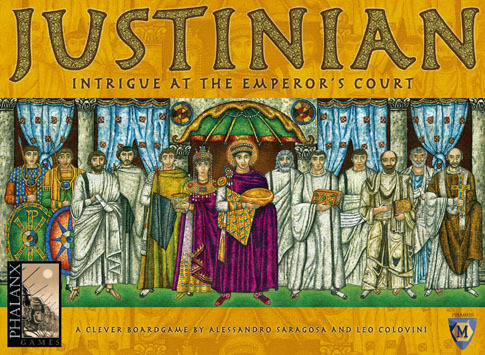 Can you within the scope of the game, use your powers to gain the edge and optimally profit from the whims of the ambitious and the unpredictable Justinian?